Outrage and condemnations from EU and European state leaders, who say attack on 'innocent believers' crosses a line. 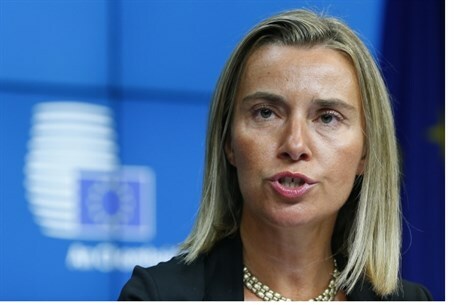 European Union foreign policy chief Federica Mogherini condemned a deadly massacre on a Jerusalem synagogue by Palestinians Tuesday as an "act of terror" and urged regional leaders to try to calm the situation. "The attack in the Har Nof synagogue this morning killing at least four people can only harm any step forward towards peace. It is an act of terror against worshippers at morning prayers and is condemnable by all means," Mogherini said in a statement. German Foreign Minister Frank-Walter Steinmeier, who visited the region over the weekend, said he was "profoundly shocked". "That a house of God should become the theatre for such deadly attacks against innocent believers is a terrible transgression in a situation which is already extremely tense," he said. "This adds a religious aspect to the numerous political questions which are still unresolved, giving an already serious conflict a dangerous (new) dimension," he added. Tuesday morning's massacre saw two Arab terrorists enter the Agassi St. synagogue with knives, guns, and axes before opening fire on worshippers. Four were killed and at least six other were injured; all of them were wearing the traditional prayer shawls and tefilin (phylacteries) as they were being attacked. The Popular Front for the Liberation of Palestine - a faction within Mahmoud Abbas's PLO - claimed responsibility for the attack. Both Hamas and Islamic Jihad praised the slaughter and called for similar attacks to follow. In response, security officials have stated that reservists will be called up to secure the city and Prime Minister Binyamin Netanyahu has called an urgent Security Cabinet meeting for later Tuesday. But the European Jewish Congress (EJC) has called for political sanctions as well, urging the EU earlier Tuesday to introduce limits to its policies and aid money to the Palestinian Authority (PA).